Teenagers who regularly smoke cannabis suffer long lasting brain damage and are in much greater danger of developing schizophrenia. American researchers say the drug is particularly dangerous for a group of people who have agenetic susceptibility to the mental health disorder – and it could be the trigger for it. Asaf Keller, of the University of Maryland School of Medicine, said the results highlight the dangers of teenagers smoking cannabis during their formative years. The study, published in the journal Neuropsychopharmacology, exposed young mice to the active ingredient in marijuana for 20 days. It found that their brain activity was impaired, with the damage continuing into adulthood. The past 20 years has seen major controversy about the long-term effects of marijuana, with experts divided over its long-term effects on teenagers. Previous research has shown that children who started using marijuana before the age of 16 are at greater risk of permanent brain damage, and have a significantly higher incidence of psychiatric disorders. 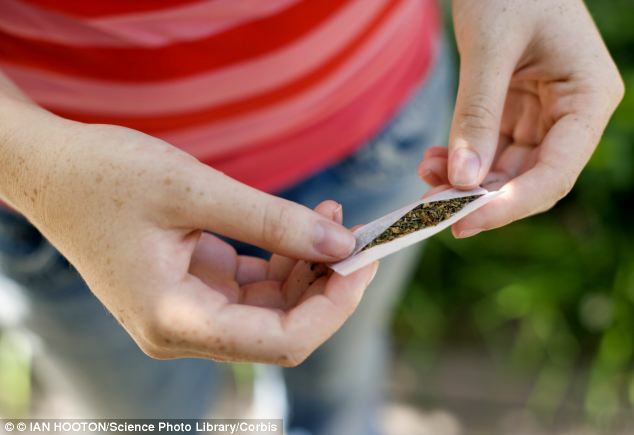 ‘Adolescence is the critical period during which marijuana use can be damaging,’ said the study’s lead author, Sylvina Mullins Raver, a PhD candidate at the University of Maryland School of Medicine. The scientists began by examining cortical oscillations in mice. Cortical oscillations are patterns of the activity of neurons in the brain and are believed to underlie the brain’s various functions. These oscillations are very abnormal in schizophrenia and in other psychiatric disorders. The scientists exposed young mice to very low doses of the active ingredient in marijuana for 20 days, and then allowed them to return to their siblings and develop normally. ‘In the adult mice exposed to marijuana ingredients in adolescence, we found that cortical oscillations were grossly altered, and they exhibited impaired cognitive abilities,’ said Raver. The scientists repeated the experiment, this time giving marijuana to adult mice that had never been exposed to the drug before. Their cortical oscillations and ability to perform cognitive tasks remained normal, indicating that it was only drug exposure during the critical teenage years that impaired brain activity. ‘We found that the frontal cortex is much more affected by the drugs during adolescence,’ said Keller. Keller now wants to know whether the effects can be reversed. ‘We are hoping we will learn more about schizophrenia and other psychiatric disorders, which are complicated conditions,’ he said. A separate study by Imperial College London last month revealed that long-term use of cannabis destroys dopamine, the feel-good chemical in the brain that inspires a spirit of get-up-and-go. Previous research has suggested taking marijuana can lead to individuals becoming withdrawn, lethargic and apathetic. The cannabis users in the study published in Biological Psychiatry had all experienced psychotic-like symptoms while smoking the drug such as strange sensations or having feelings of paranoia. The researchers expected their dopamine production might be higher since this has been linked with psychosis – but instead found the opposite. The cannabis users had their first experience with the drug between the ages of 12 and 18 and the researchers believe the drug could be the cause of the difference in dopamine levels. ‘Cannabis is an illegal drug and there is mounting evidence the idea of it being a harmless herb is not true,’ said Dr Michael Bloomfield, of Imperial College London. ‘When people stop taking cannabis it seems the brain can slowly go back to producing pretty normal levels of dopamine.